But after reading how you need to register your drone to fly it legally in Thailand, I decided to leave mine at home. I didn’t want to risk getting it confiscated. 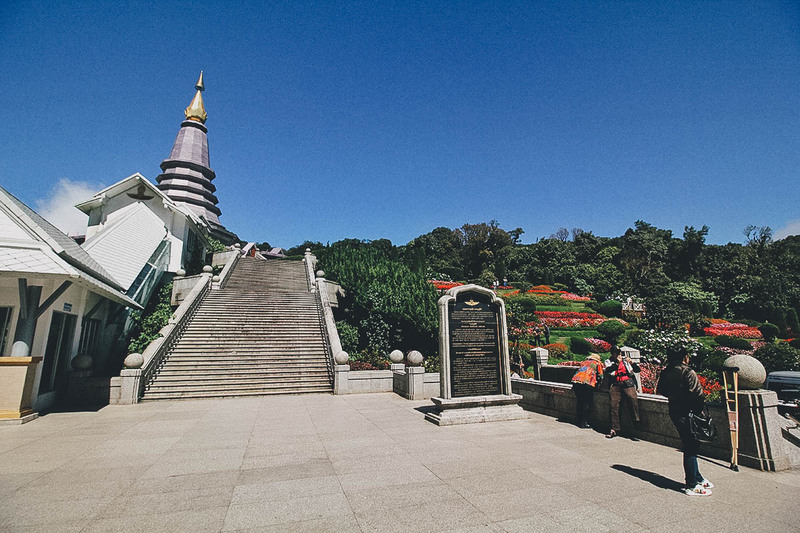 Sure, I was disappointed, but I didn’t let that stop me from going to Doi Inthanon National Park anyway. The views from atop that mountain seemed too stunning to pass up. 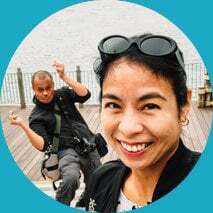 We had almost seven full days to play with in Chiang Mai so a day trip to Doi Inthanon, drone or not, was something I had to do. Doi Inthanon is the highest mountain in Thailand. 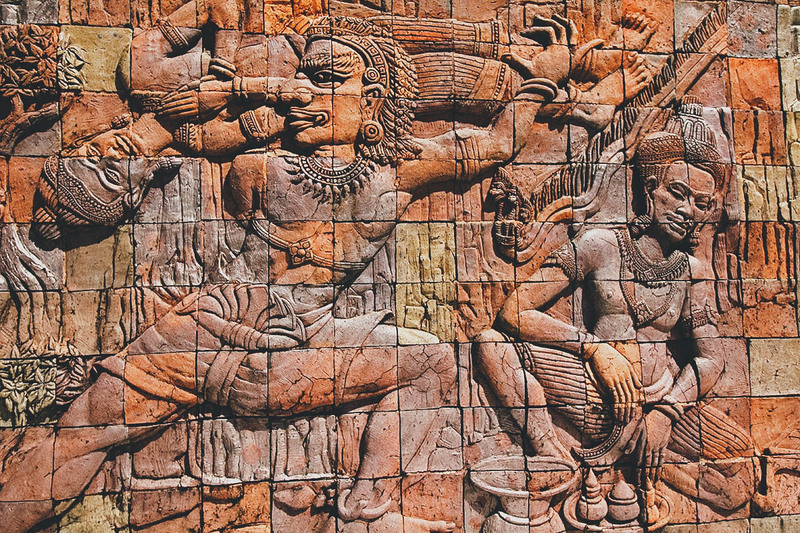 It’s at least a two hour drive southwest of Chiang Mai Old City. The entire park covers an area of 482 sq km and is part of the Himalayan mountain range. At its highest point, it has an elevation of 2,565 meters. That’s about a quarter as high as Mt. Everest (8,848 m). 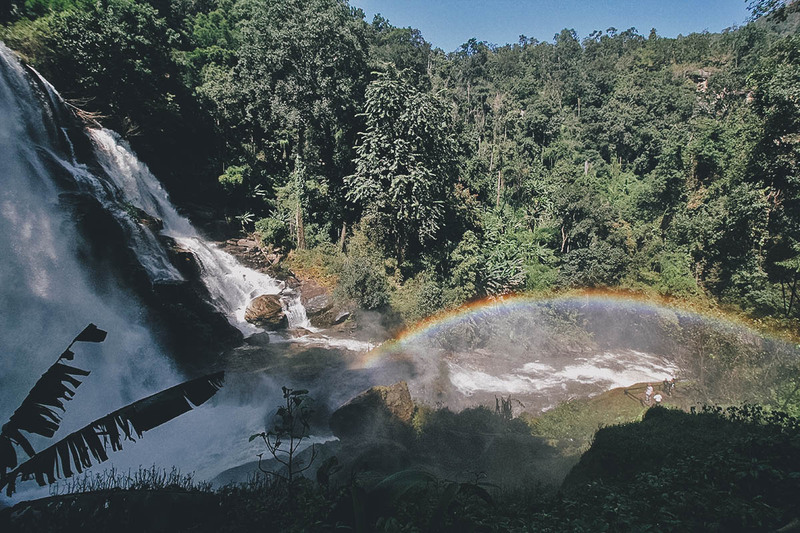 Doi Inthanon National Park is a popular camping area with many hiking trails and waterfalls. It’s home to over 360 bird species making it one of the best places to go bird watching in Thailand. 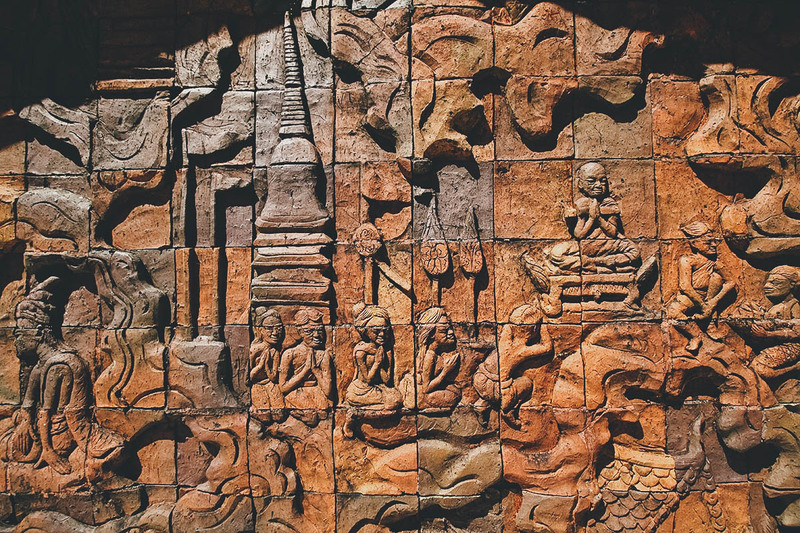 But for all its natural beauty, its perhaps best known for its two adjacent chedis or stupas called Naphamethinidon (นภเมทินีดล) and Naphaphonphumisiri (นภพลภูมิสิริ). 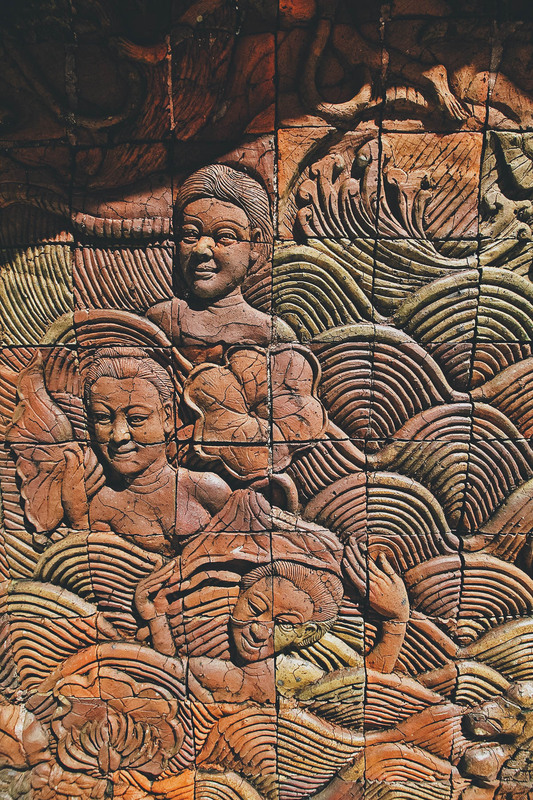 Naphamethinidon means “by the strength of the land and air” while Naphaphonphumisiri means “being the strength of the air and the grace of the land”. 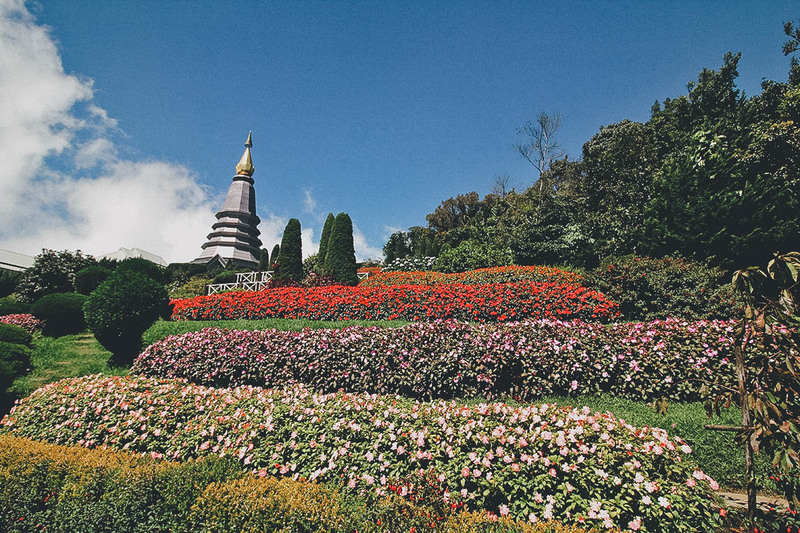 Entrance to Doi Inthanon National Park is THB 300 for adults and THB 150 for children. 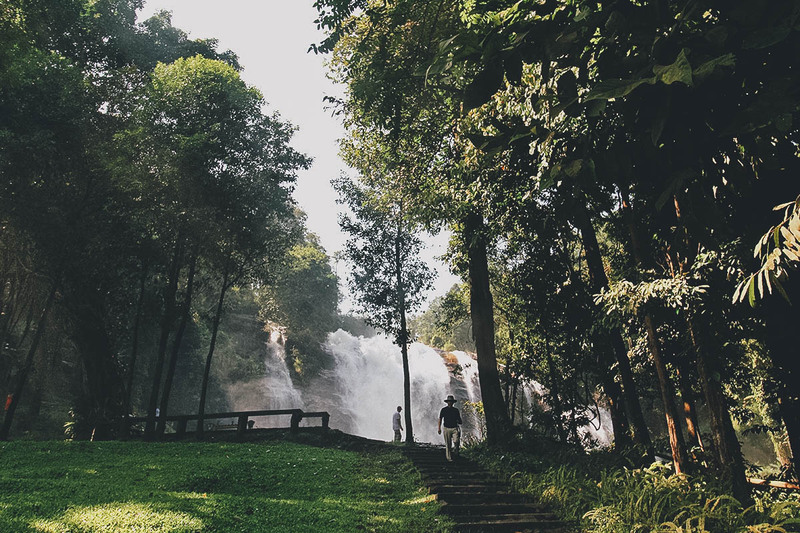 Though it’s probably best to rent a car and explore Doi Inthanon National Park on your own, it’s easiest to go by organized tour. It’ll stop at several of the park’s key points and give you enough time to take pictures. As described, the park is at least two hours each way from Chiang Mai Old Town, so a day tour will pretty much take up an entire day. I went courtesy of Kkday and their Doi Inthanon National Park tour costs THB 1,120 for adults and THB 720 for children. It lasts about 10 hours, from 8AM till 6PM, and includes park entrance fees and lunch. I don’t know if all tour operators follow this same itinerary, but this is what we did on our Kkday Doi Inthanon tour. 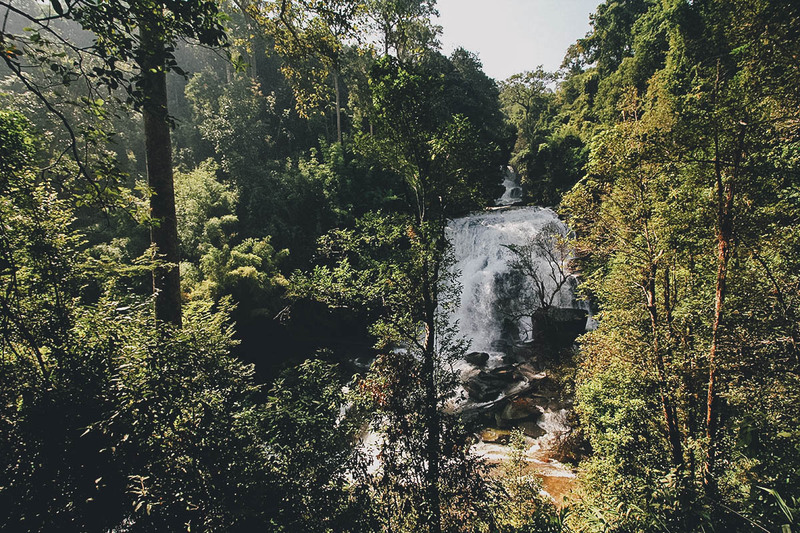 After driving for two and a half hours to Doi Inthanon National Park, our first stop was Sirithan Waterfalls, which is one of two waterfalls we would visit on today’s tour. Our van let us off at a parking area by the side of the road so we could walk along a 200 meter trail down to this viewing platform. Pretty eh? We were allowed about 20 minutes here to take pictures. Next up was a quick visit to the highest spot in Thailand. There’s an actual marker there where you can take pictures as proof of your visit. See that thermometer on the sign? 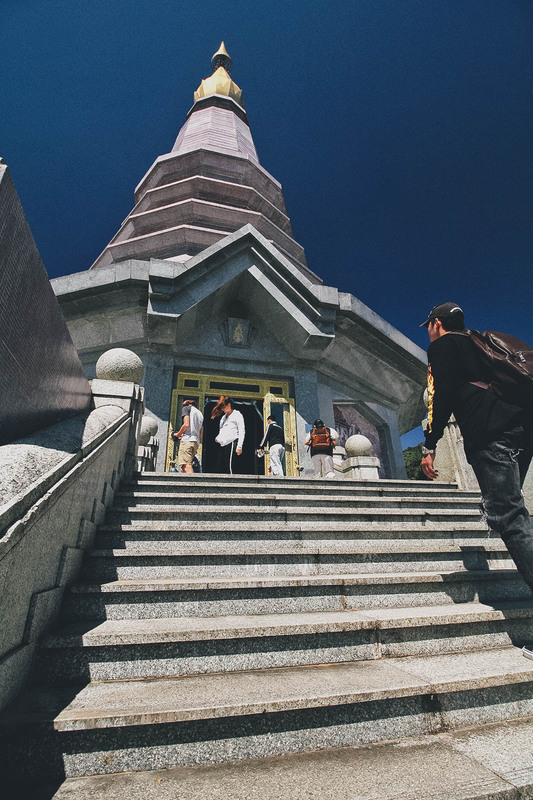 It’s known to get quite cold on Doi Suthep so be sure to dress warmly. We went in early November and I was wearing two t-shirts under a button down and that was more than enough. A shirt under a light sweater or hoodie is recommended. 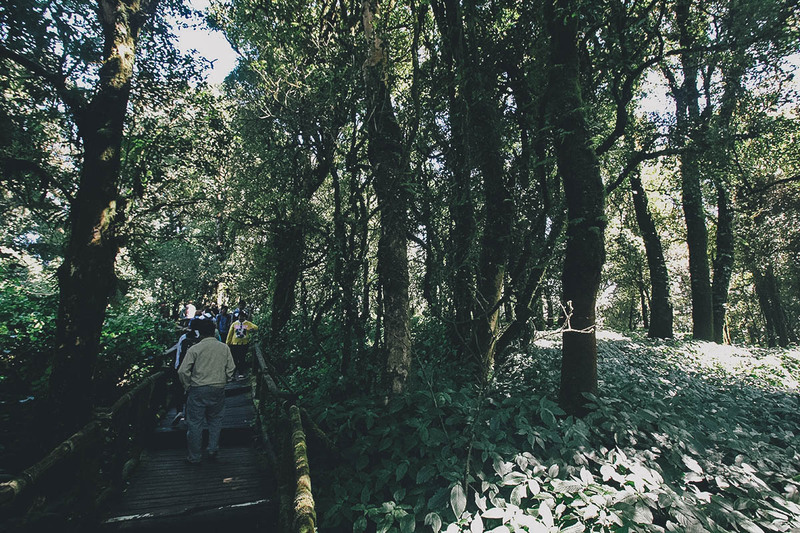 To get to the highest point, you go through this boardwalk trail that cuts through the forest. It’s a short and easy walk that takes you through lush vegetation. It smelled wonderful here, very fresh and woodsy. If I remember our guide correctly, this was the shrine containing the remains of King Inthawichayanon, after whom Doi Inthanon is named. The mountain used to be called Doi Luang. 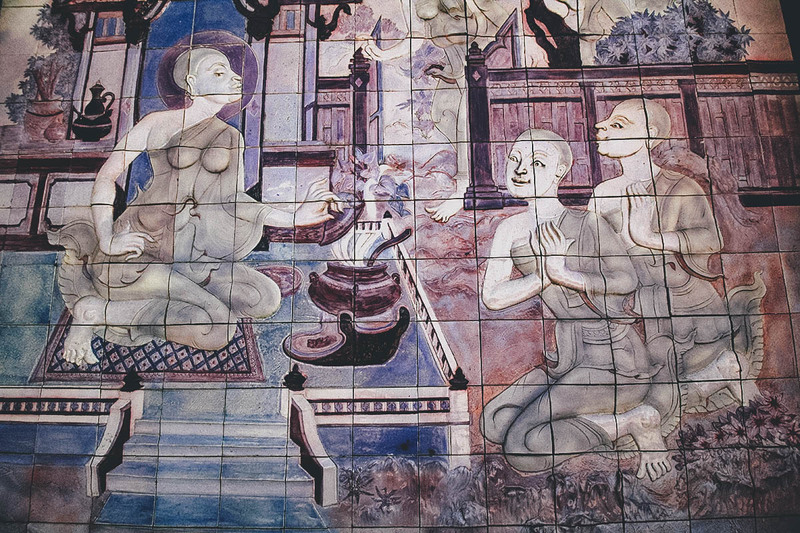 One of the last kings of Chiang Mai, King Inthawichayanon ordered his remains be interred at Doi Luang after his death. During his life, he did much to preserve these forests so it was renamed after his death in his honor. 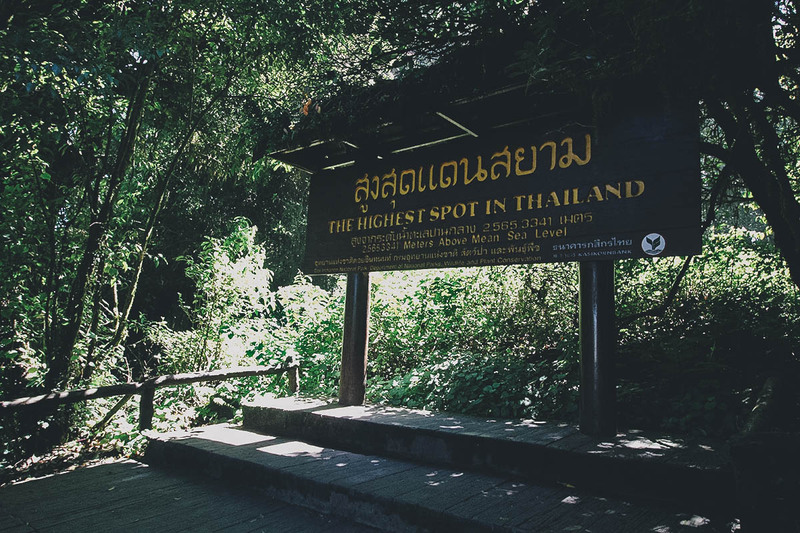 There it is, the highest spot in Thailand, which ironically, isn’t actually the highest spot. 😆 The true peak is located a few meters away, adjacent to King Inthawichayanon’s memorial shrine. 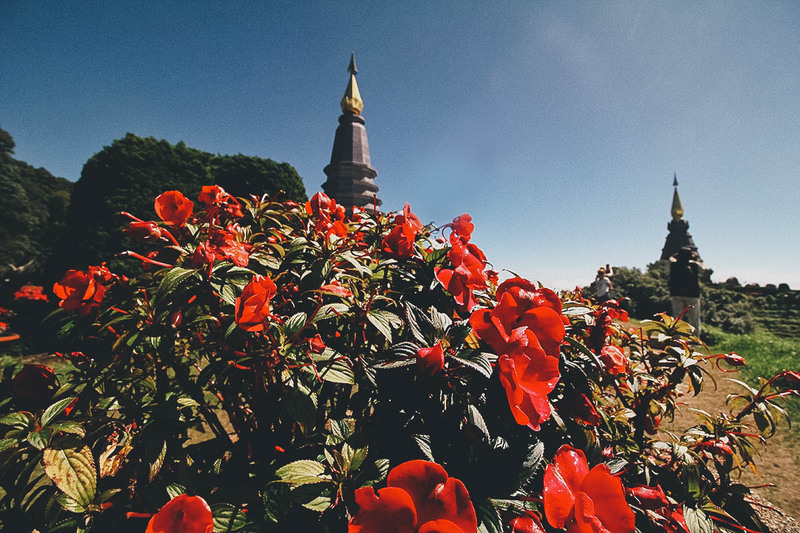 These are the aforementioned chedis which are the most recognizable landmarks of Doi Inthanon National Park. 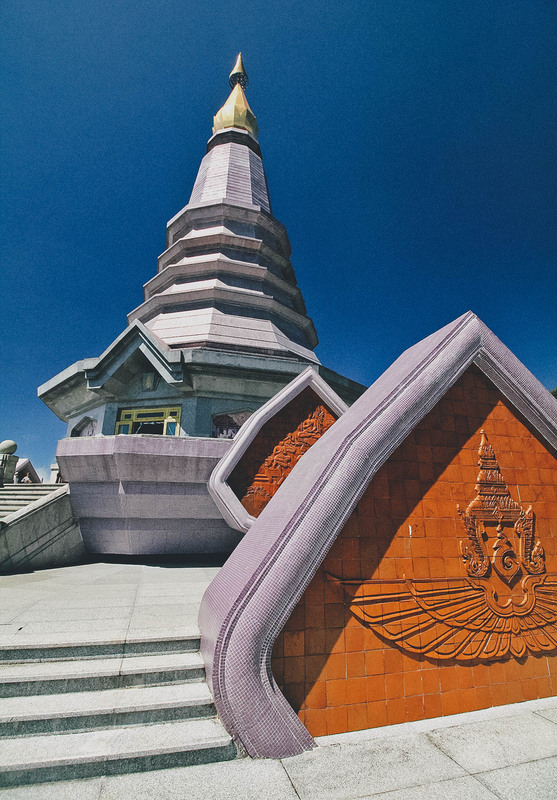 Naphamethinidon, or King’s Pagoda, was built in 1987 to honor the 60th birthday of King Bhumibol Adulyadej. 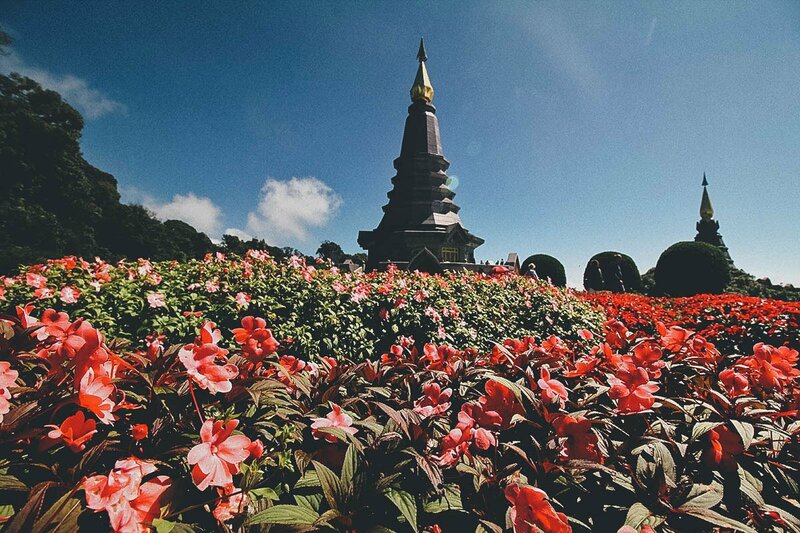 Naphaphonphumisiri, or Queen’s Pagoda, was built five years later in 1992 to honor the 60th birthday of Queen Sirikit. Admission to the pagodas was included in our tour but people who visit the park on their own need to pay an additional THB 40 each on top of the park entrance ticket. 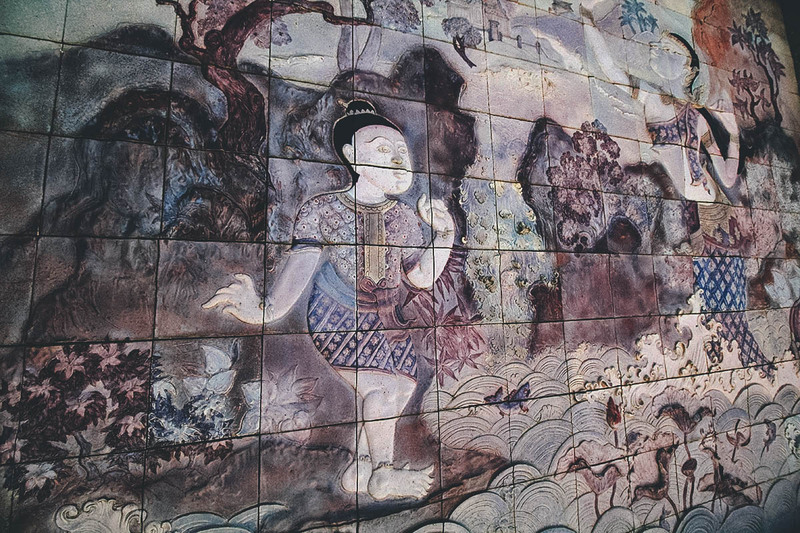 When we got there, we were advised to visit the King’s Pagoda first before moving on to the Queen’s Pagoda. 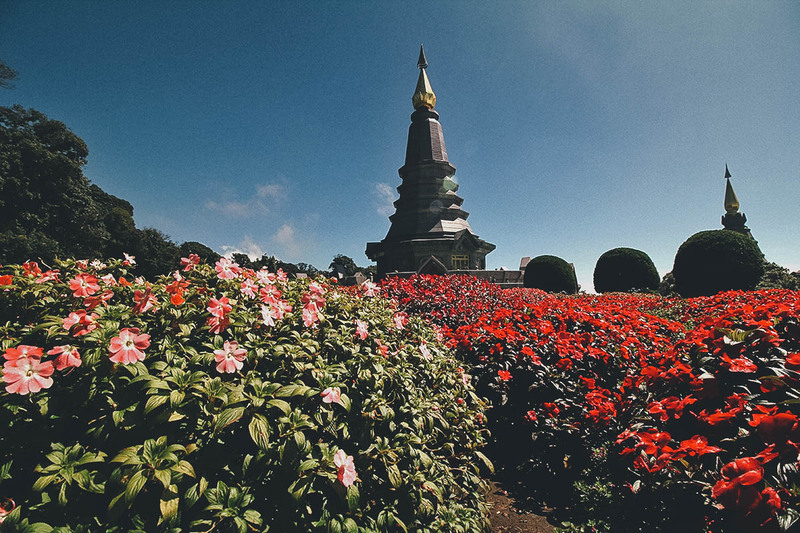 Only from behind the Queen’s Pagoda, in the Royal Gardens, are you able to fit both pagodas into the same picture. Though identical (as far as I could tell) in shape and size, it was easy to tell them apart. The Queen’s Pagoda is purple. The King’s Pagoda wasn’t as attractive as the Queen’s but it did have some beautiful relief mosaics. This is the Queen’s Pagoda. It’s a lovely, feminine shade of periwinkle. Even its relief mosaics are purple. The pagodas are pretty up close but they’re best appreciated from the Royal Gardens. When it comes to these flowers, be sure to look and not touch as picking them carries a hefty fine. 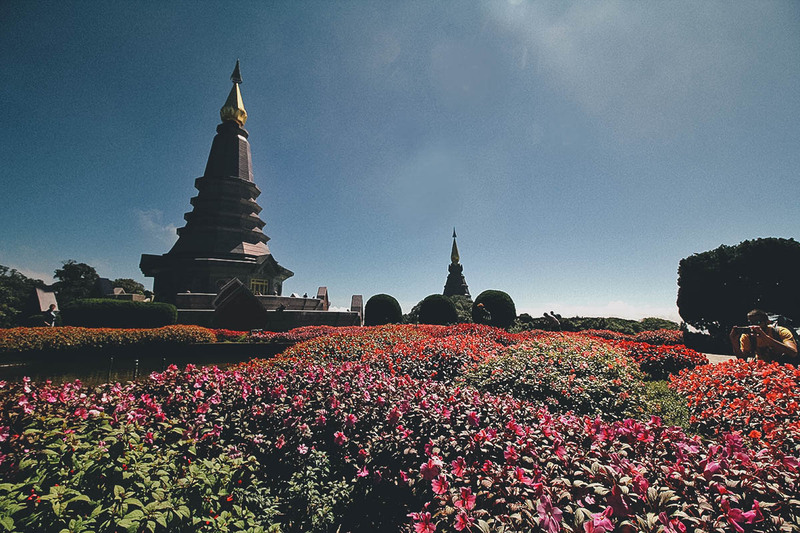 The King and Queen Pagodas in all their Doi Inthanon glory. As described, this is the only spot where you can take pictures showcasing both pagodas. The flowers here are lush, beautiful, and well cared for. We spent the longest amount of time here at the garden and chedis, around an hour. 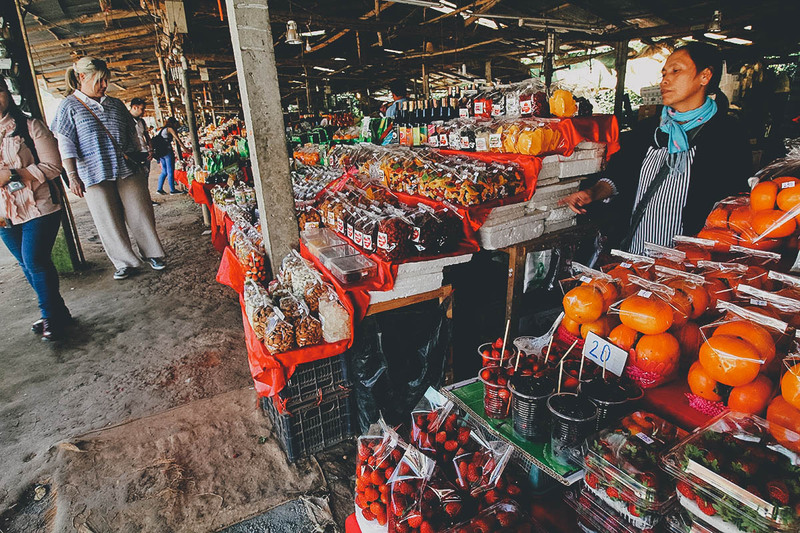 Before having lunch, we make a quick stop at Doi Pui Hmong Market. This is where the hill tribe people sell their crops. Our guide told us a story about this place that I found very moving. The Hmong people migrated to Northern Thailand from China. They couldn’t speak the Thai language so it wasn’t possible for them to find work in the city. To subsist, they grew opium in these mountains. When King Bhumibol Adulyadej visited Doi Inthanon in the 60s, he saw the opium fields and asked the Hmong people to stop growing them. But with no other means of income, they couldn’t. To solve this, King Bhumibol imported crops from countries like Japan, crops that could grow and thrive in Doi Inthanon’s similarly cold climate. He learned how to grow these crops in Thailand, and once he achieved success, he passed on that knowledge to the Hmong people so they could shift to crops other than opium. But he didn’t stop there. Not only did he teach them how to grow new crops, but he made sure to buy from them as well. Once harvest time came, he would buy their crops and distribute them throughout Thailand. I don’t remember the exact numbers but our guide explained to us how expensive strawberries used to be when Thailand had to import them. 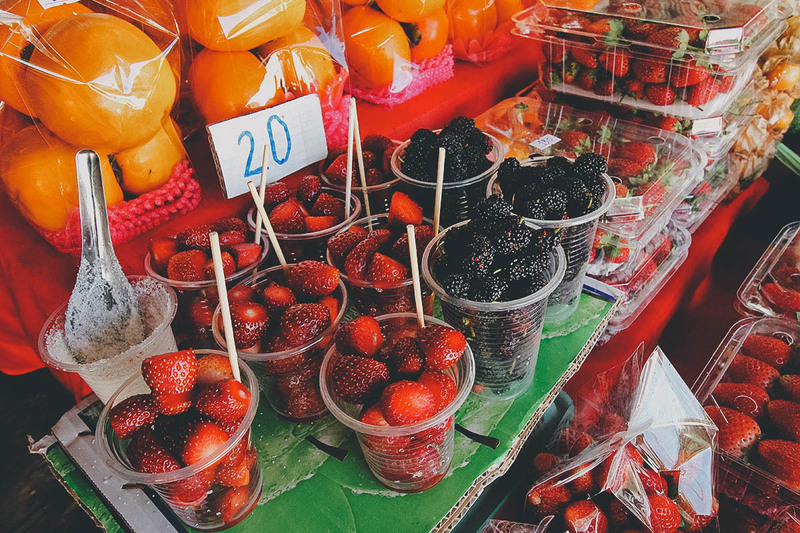 Now that they’re grown locally, prices have dropped significantly. The hill tribe people cultivate flowers in these mountains too. These were interesting. 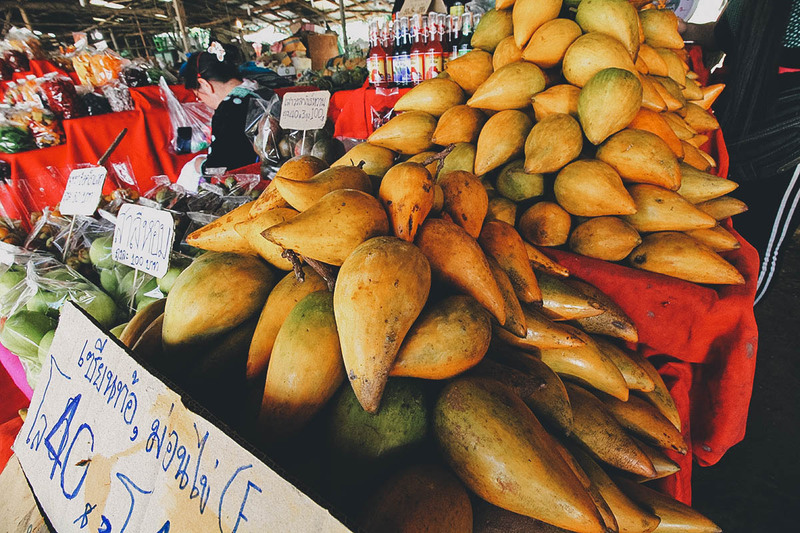 I thought they were just pointy mangoes but as it turns out, they’re an entirely different fruit altogether called canistel fruit. The vendor gave me a taste and it was mildly sweet with a texture similar to egg yolk, hence its colloquial name “egg fruit”. To my surprise, I read that they’re cultivated in my native Philippines as well though I’ve never seen them. I had never even heard of them until today! By the time we sat down for lunch, it was already a little past 1PM. 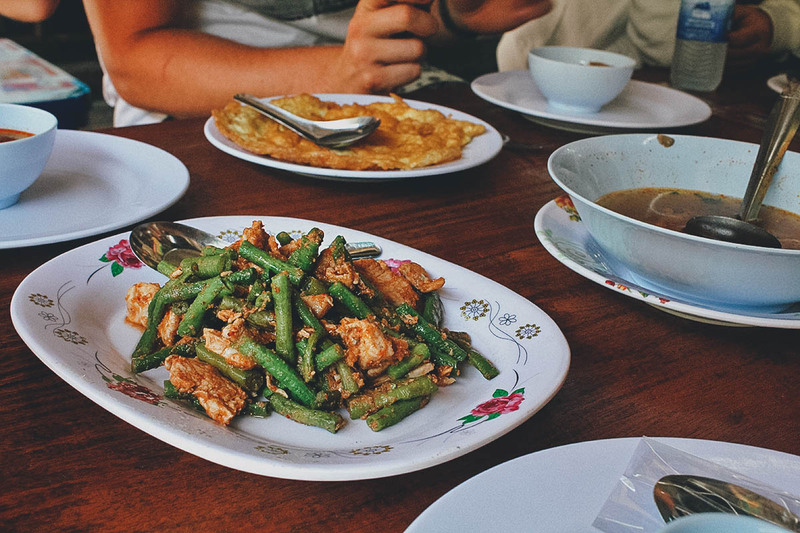 We had a simple lunch of tom yum soup, chicken with green beans, stir-fried vegetables, and omelette at a restaurant next to Wachirathan Waterfalls. 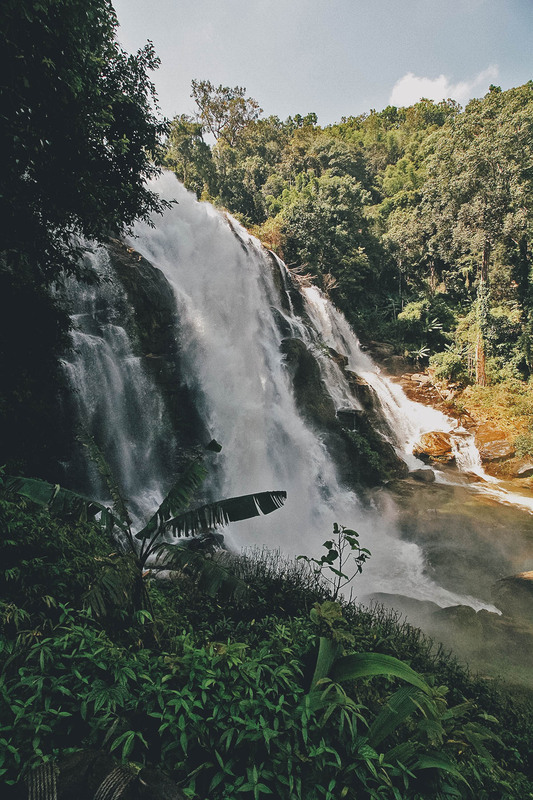 We only had about an hour to spend here so I quickly devoured my lunch and made my way to Wachirathan Waterfalls, which is more impressive than Sirithan Waterfalls. It’s more impressive because you could get closer to it and there was a surprise waiting for you at its base. Keep scrolling to see it. Climbing up the stairs takes you to a platform with a great view of the waterfalls. There’s a strong mist here so take care of your electronics! This was the surprise I was telling you about. Isn’t it amazing? I had never seen a rainbow start and end at the base of a waterfall before. According to our guide, this rainbow always appears at this spot on sunny days. Google “wachirathan waterfalls” and you’ll see! Before heading back to Chiang Mai, we make our final stop at this Karen Village. The Karen people are originally from Myanmar. 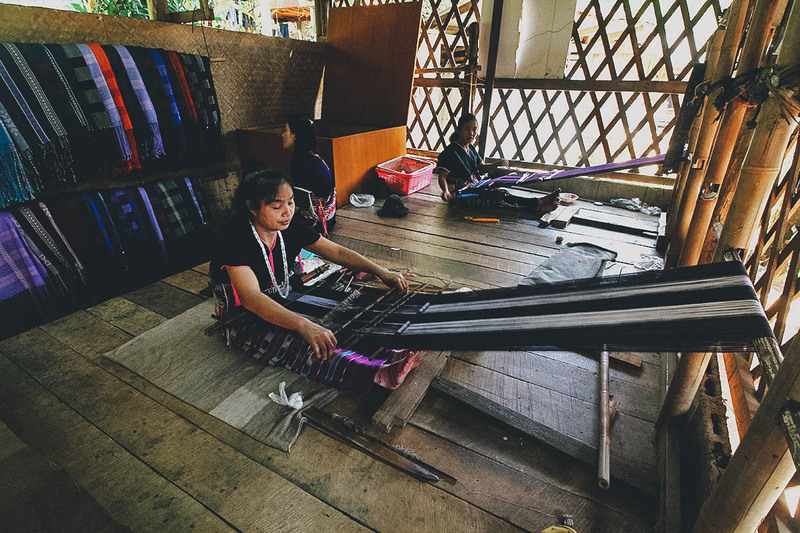 According to our guide, there are many sub-groups of the Karen people, one of the most recognizable being the Padaung tribe known for the neck rings worn by their women. 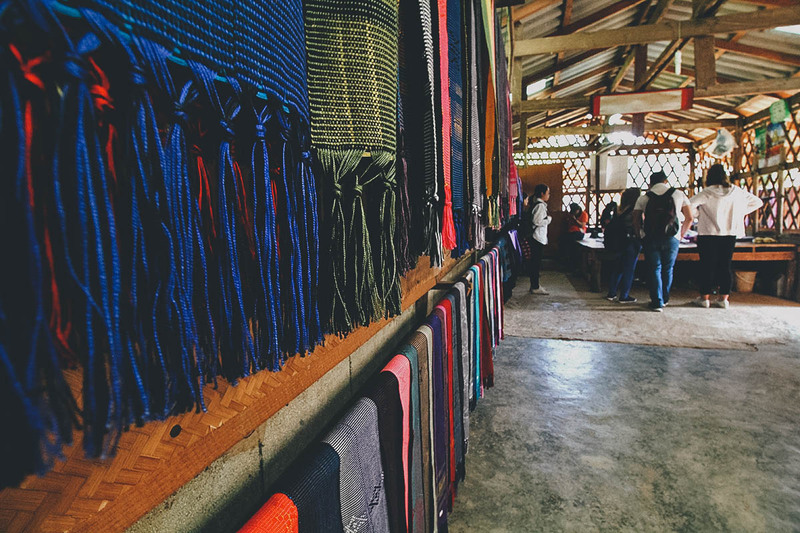 Three married Karen women weaving textiles. You can tell they’re married from the way they’re dressed. If they were still single and ready to mingle, then they’d be wearing white. 😉 We drove back to Chiang Mai after this. 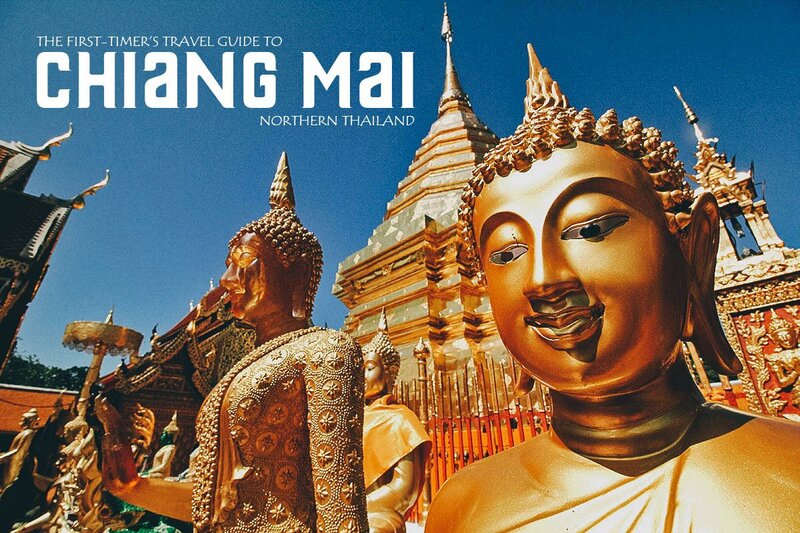 Check out this short video I put together of seven fun things to do in Chiang Mai, which includes footage from this day tour to Doi Inthanon National Park. IS THE DOI INTHANON TOUR WORTH IT? If you have the time, then yes. 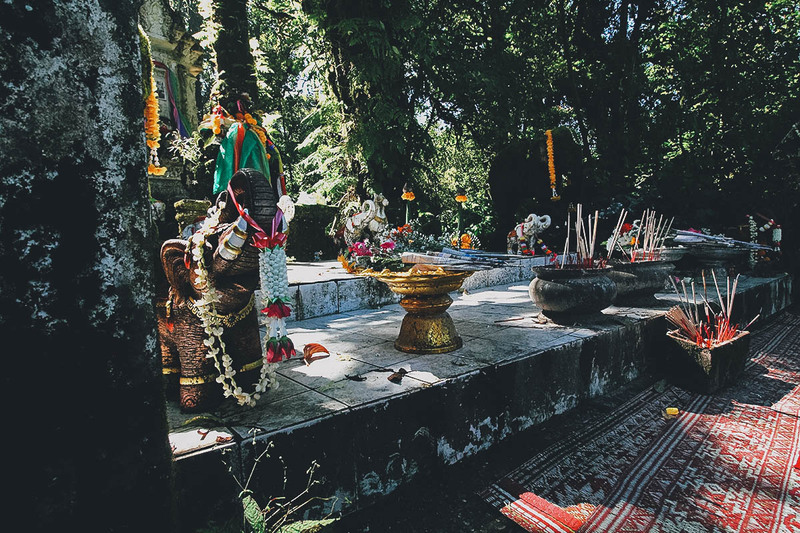 If you’re staying long enough in Chiang Mai, then a day or overnight trip to Doi Inthanon is something to consider. The views are spectacular and it’s always fun visiting mountains. I much prefer it to laying out on a beach. But as much as I enjoyed this Doi Inthanon tour, it did feel rushed the entire way. Several people online made similar comments so I was already expecting it. With only so much time at each stop, I found myself checking the time often lest I get left behind and have to hitchhike my way back to Chiang Mai. It definitely detracted from the overall experience. The thing is, being over two hours away each way, the tour operators don’t really have a choice. This day tour lasts ten hours as it is so allowing you more time to explore just isn’t possible. If you can, then the best way to experience Doi Inthanon is to rent a car and stay overnight. That way you can enjoy everything at your own pace, even do a few hikes. I saw pictures online and some of the trails here look stunning. For those interested in a day trip to Doi Inthanon, you can purchase advanced tickets through Kkday. As described, this exact tour costs THB 1,120 for adults and THB 720 for children. 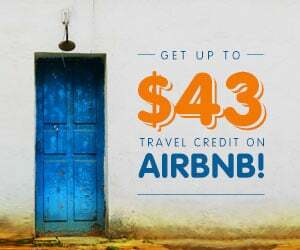 I’m a big fan of Kkday and often use them to find deals when we travel. I haven’t done this but for anyone looking to drive to Doi Inthanon National Park from Chiang Mai, I found these driving directions on bangkok.com. As described, the drive is said to take at least two hours each way. I read that it’s advisable to rent a car with a bigger engine, preferably at least 1.5L. You’ll need the extra horses to power up that mountain. Take route 108 towards Chomthong. Drive along this road for about 57 km (35 miles) then turn right onto route 1009 (Chomthong-Doi Inthanon Road). 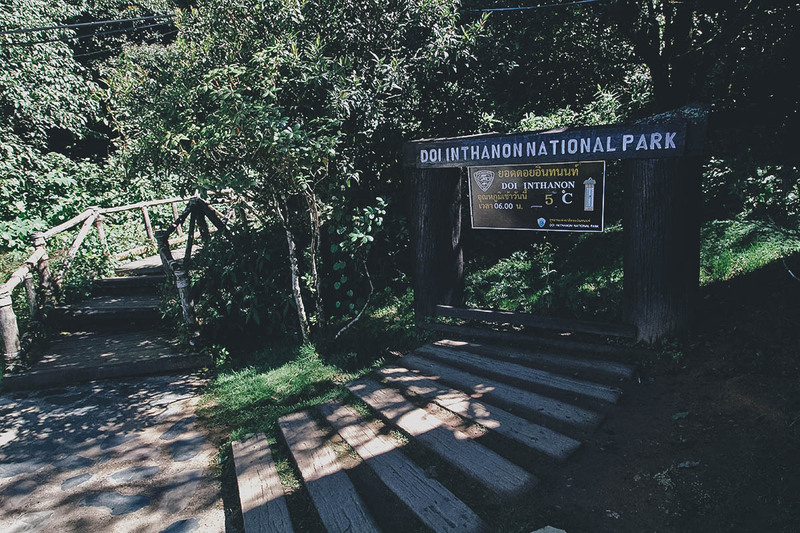 Drive along this road for another 31 km (19 miles) to get to the entrance of Doi Inthanon National Park. Kkday sponsored my day trip to Doi Inthanon in exchange for an honest account of the experience. They didn’t ask me to do this. I went through their site and chose this activity on my own volition. As always, all words and opinions expressed in this post are mine and mine alone. What an awesome place to visit! !